Millfield High School can reflect on an outstanding rugby season. The Thornton school’s Year 10 team stormed into the final of England Rugby Unions’s Emerging Schools festival after confident victories over Clitheroe and St Mary’s. Despite a superb team performance, the Millfield lads lost in the final leg to a very strong team from Carnforth. Outstanding individual performances came from captain Josh Wood, Ebie Salem, Ben Willis Jayden Green. Hot on their heels, the Year 9 team went one step further to be named joint winners of their entire group. Their journey saw them beat Highfield and Carnforth before facing Garstang in the final. Despite unfailing efforts and quality tackling from every player, Millfield had to settle for a draw but against a team as strong as Garstang this was quite some accomplishment. Time restrictions prevented extra-time being played. The Year 9 boys, bolstered by some additions from the year 8 squad, were entered in to the Lancashire plate. The boys’ first trip was an away tie to Bury Grammar School. Millfield were the underdogsbut paid no attention to this label. 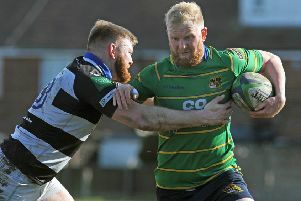 Millfield dominated the Bury pack right from the start as Lewis Bates, Danny Inman and the Christodoulou brothers tackled strongly to repel every Bury attack. The Millfield boys played great attacking rugby, running the ball from every part of the pitch. They ran out winners 34- 17. This set up a home semi-final against Queen Elizabeth Grammar School. The Millfield boys gave an exhibition of how rugby should be played with a dominant display. Outstanding performances from Alex Jones and Alex Evans set the tone. Millfield won this semi-final by a comprehensive 57- 10 scoreline. This put Millfield into the final against Ormskirk at Liverpool St Helens. It was a match of ferocious intensity, with both teams praised by the watching Lancashire RFU officials. However, Millfield could not retain the silverware they won last year as Ormskirk won 14-10. They boys showed fantastic character, resilience and maturity all season and will be a team to watch next season. Millfield have more than 70 boys playing rugby from year 7- 10. The school’s success has brought recognition from the English RFU and Millfield has been enrolled on to a three-year all school’s programme. Millfield have been given a budget of around £7,500 to develop rugby locally and has received additional kit and equipment. There is also an opportunity to design a bespoke kit for the school and unveil it at Twickenham in next year’s RBS 6 Nations. Four members of the Millfield squad are having trials with Lancashire: Owen Williams, Lewis Bates, Mitch Gorse and Luke Brocklehurst.